One of the things I’ve come to believe in very strongly after more than 25 years in the water treatment business is water testing. Water plays such an important role in our lives that it only makes sense to know as much as possible about the water we use. A high quality water test is worth many times its cost. Whether you have a private water source or get water from a city supplier, an independent water test will give you extremely valuable information about your water. It you find out that you have great water with no significant treatment issues, that is the most valuable information of all, and the test pays for itself many times over, both in peace of mind and in avoidance of purchasing unneeded equipment. If you learn that you have an unsafe level of a health-threatening substance like lead, arsenic, E.coli, chromium, or fluoride that needs immediate treatment, the test pays for itself many times over. Pure Water Products offers free testing for the most basic water issues like hardness, pH, and total dissolved solids, and we also offer comprehensive water test packages from National Testing Laboratories that provide a complete picture of your water. We’ve been offering the NTL WaterCheck and WaterCheck with added pesticides packages for a number of years, and we have recently added specialty test packs for city water users and specific well water issues. Details about our free tests and the inexpensive National Testing Laboratories tests are on our main website. 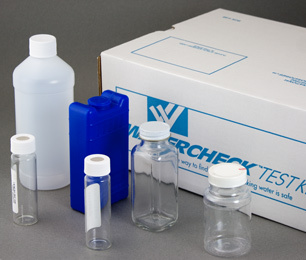 The WaterCheck Test Kit has everything you need to overnight the samples to the test lab. The test kit price includes both the kit and the testing itself. Turbidity measures the general clarity of the water The lower the number, the cleaner and clearer the water. The measurement is in FTU. (Most testing for turbidity reports in NTU, but our LaMotte equipment calls it FTU. In either case, it’s an an arbitrary scale designed to measure turbidity.) Above 1 FTU can be considered an issue of concern, although water often measures considerably higher. Turbidity not only can be an aesthetic nuisance; its presence also can offer a breeding ground for bacteria. The test is done by shining a light through the water and recording how much is blocked by particles in the water. Hardness is a measurement of the calcium and magnesium content. These minerals form scale in pipes, keep soap from lathering, and ruin appliances. The measurement is given in grains per gallon. A grain of hardness represents 17.1 parts per million. Water is usually considered hard enough to require treatment at about 7 grains per gallon. pH is a measurement of the relative acidity/alkalinity of water. Seven is a neutral pH and anything lower is acidic and anything higher is alkaline. Mildly alkaline is usually viewed as the ideal pH. While 6.0 doesn’t seem a lot under 7, it is actually quite acidic– enough to cause sever damage to plumbing, creating pinhole leaks in copper pipes, and causing water to pick up bad tastes from metals it comes in contact with. pH is a very important factor that influences many water treatment strategies. For example, iron and manganese are much more easily removed by filtration at a high pH. Sometimes it is necessary to raise the pH of the water as part of the iron treatment procedure. Hydrogen sulfide must be tested on site and its rotten egg odor is usually obvious enough that a test is not needed. Treatment of 2 or 4 or 6 parts per million hydrogen sulfide would be essentially the same, so self-diagnosis is usually practiced. To treat it, however, it is very helpful to know if there is also iron present, the pH of the water, a whether or not dangerous bacteria like e Coli are also present. The presence of iron, on the other hand, is easy to detect by red staining on fixtures and clothing, but it should never be treated unless testing has been done to determine pH and hardness. Finding a treatment strategy that works with iron (e. g. a water softener, an “iron filter” with or without an added oxidizer like air or chlorine) is just a guess unless you know at least the basic characteristics of your well water.